We all have Seen The daily Show, Colbert Report, Tea party and liberals always comparing Mitch McDonnell to a turtle. So the inspiration of this new 3d printed sculpture in my line of political corrupter inaction figures needs little explanation. 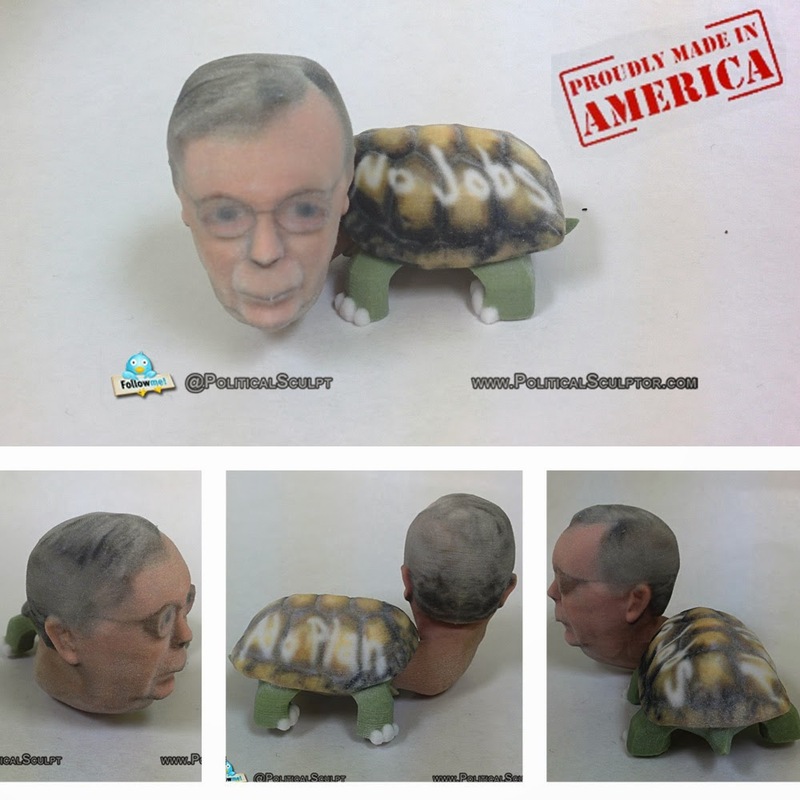 Mitch McDonnell is like the tortoise of the senate. This guy has been in the senate for over 30 years and he keeps getting re-elected over and over not because he does a good job.. He gets re-elected because he has been doing the bidding for his corporate buddies for decades. They Keep his re-election chest filled with millions and in return he does their bidding in the senate. However, i find comparing Mcdonnell to a turtle extremely offensive. No for real i think this is extremely offensive turtles that is.. No turtle has ever Shut Down the government, no turtle has ever filibuster Veteran Benefits, No Turtle has ever filibuster equal pay for women, no turtle has ever filibustered, unemployment extension. So please stop comparing turtles to this heartless, corporate funded excuse of a senator. This guy is perfect for my fellow friends in kentucky who have been represented by this excuse of a senator. If you ever watched the show breaking bad in the Episode "tortuga" you will be able to to see the resemblance of why i graffiti the words "no jobs" "no plan" on the back of the turtle". So if you are a fan of the show and a fan of politics you will love this inaction figure. I hope you guys like it.. i'm open to new ideas and suggestions so please follow me on my website at politicalsculptor.com follow me on twitter at @politicalsculpt or look me up in facebook "political sculptor"